With a Magic Lantern card, launch the Firmware Update process and follow the instructions on-screen. How can I remove it?? I went to canon menu... firmware update... and i check OK to update... it shows up a screen saying loading for 1 second and then after a while it goes back to the main menu and says: "enable bootdisk " and it seems that magic lantern is bypassed (like when we turn on the camera and leave "set" key pressed. 1. You have the necesary files in the SD card: *.fir file (only if you need to set the bootflag on that camera; this process to be done only once), autoexec.bin file, plus the ML directory. 2. The Utility recognizes the card by identifiying it in the box next to Refresh. 5. Under Content, make sure EOScard recognizes: DCIM folder, autoexec.bin file, ML folder, and if required (to enable the boot flag on camera) the fir file. When EOScard recognizes all of those files it should give you a check mark or something like that. 6. Press the Save button. 7. Look on the bottom of EOScard and should give you a confirmation that the card was written, ie. write successful. I recently read about another situations with the newer EOScard utility in which the automatic function brought the files to the SD via internet connection. I am not familiar with this function but Pelican seems to more about it since he created EOScard utility. Anyway the issue was that EOScard utility had downloaded some files plus there were already some files in the card, the user noticed that in the fir file area it showed like 2 files so the user had to select the correct fir file for the EOScard utility to properly prepare the card! One of the files was for Mac and the other was for windows. Also on most cameras, except 5D3, if you enable the camera bootflag via firmware update, and then do it again you will be disabling the bootflag. In the 5D3 you cannot disable the camera bootfalg. The bootflag for the camera is and ON-OFF process, so if you have a camera working and set the camera flag using the *.fir file you will be disabling the flag in the camera and ML wont start. So remember to make a card bootable use EOScard utility, and to set the camera flag use *.fir file and do the firmware update. And... always use a card reader if you want this to work properly! When to my camera... firmware update.. and installed the magic lantern (because if i didn't went to firmware update the camera wouldn't read the software in the card). HOW can i remove the bootflag from camera...?? To disable the bootflag in the camera you must put the .fir file back in the card and do a firmware update (assuming that ML is running right now and bootflag is enabled). I this does not work then you could bypass ML pressing the set button on boot and then do the firmware update. Remember that you must do a card reader format in order to disable the bootflag of the card. I only own a 5D3 and a 7D so I cannot confirm this procedure for your camera. Maybe someone who owns such model can help you.. I already have the *.fir file in the card (it was never deleted...) should i remove everything and leave the *.fir file only??? (no ML folder or autoexec.bin). Or should i prepare the same files/folders in the card and go into EOSCArd utility like when i installed the first time? I was looking for the standard install/uninstall instructions for this camera and could not find them in the magiclantern-v2.3.550D.60D.600D.50D.500D.5D2.zip file. That tell me that this is not a standard install. Therefore this may not be applicable to your camera. .. I see that you already posted the question there so maybe you should PM the developer nanomad and/or TheUnkn0wn and ask to answer the question you have posted regarding the uninstall procedure. I am not saying that the above will not work, I am just saying that it could be different. Also you have double posted. Forum rules say not to double post! This should have stayed in the 700D thread! Don’t just delete the Magic Lantern files from the card! If you do, the camera will freeze at startup and you’ll have to take the battery out. ∙ Format that card from the camera (select this option: Format card, **remove* Magic Lantern*) and reboot. Your camera will load the original firmware when you use that card. 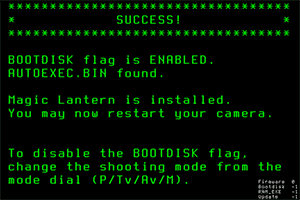 ∙ With a Magic Lantern card, launch the Firmware Update process and follow the instructions on-screen. ∙ If the card LED blinks continuously after running Firmware Upgrade, you don’t have the right Canon firmware version or sub-version. To fix it, install the official Canon firmware upgrade from the links from this guide, even if you already have the correct version number (you may have a different sub-version number). ∙ If the screen does not turn on, but autofocus works, remove the battery and format the card. This happens when the card is bootable, but autoexec.bin is not there. ∙ Check if all doors are closed. The camera will not boot if any of the card or battery doors are open! the camera and try to boot without Magic Lantern. Only after you are sure the camera is OK, you can try to see what’s wrong with Magic Lantern. ∙ If the camera asks for a firmware update, place Canon firmware on the card (this was a problem in older versions). ∙ DO NOT use a bootable card without a working autoexec.bin on it! If you do, remove the battery immediately, switching the camera off is not enough !!! ∙ Check our support forum for similar problems; if you can’t find the solution, just ask. Wait a second... when you refer to *.fir file... did you mean the original canon firmware update file... or the one that came with the magic lantern nightly build? Because if it is the original... that is why i can't get rid of it.. because i'm using the one that came with the bootflaged magic lantern. If that is the case.. i still don't have any update file... and therefore... i'm screwed. Why are you so worried about removing the bootflag? It doesnt' affect the camera, just tells it to look for a bootable card. If you don't want ML, just format the card on your computer and your camera will operate normally as from Canon. It's just that i thought it would be a clean unninstalation, so that if i encounter any future problems (not directly related to ML) i can easily send it to Canon without worrying that they will come back to me and say.. "it's firmware was tempered so we won't fix it"
I just like to have that option you know? I am not aware of such an issue ever being reported. * startup time is increased from 0.1 seconds to approx 1.2 seconds (without loading ML). If loading ML from a card, the startup time is more like 1.7s. This is the time from switching on the camera to being able to take the first shot, and crucially wake-from-sleep takes exactly the same amount of time, which is a PITA for stills shooters. * you can't use EyeFi cards in a camera that has the boot flag enabled. There is currently no way to disable the boot flag on the 5d3 once enabled AFAIK. Have you (or someone else) removed the boot flag on the t5i? I really wanna try ML on my camera, but first I want to make sure it's completely "removable".